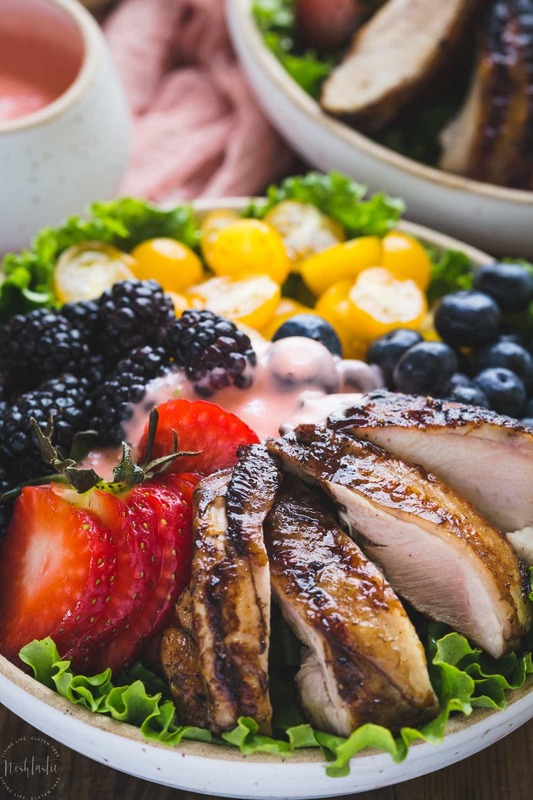 My Paleo Balsamic Chicken Salad is made with skinless chicken thighs marinated in balsamic vinegar, garlic, Dijon mustard and cooked to perfection on the grill before being served over a bed of lettuce with delicious Summer fruits and topped with a Creamy Dairy Free Strawberry Vinaigrette! Balsamic Vinegar is such a versatile ingredient and is so much more than half of a vinaigrette! 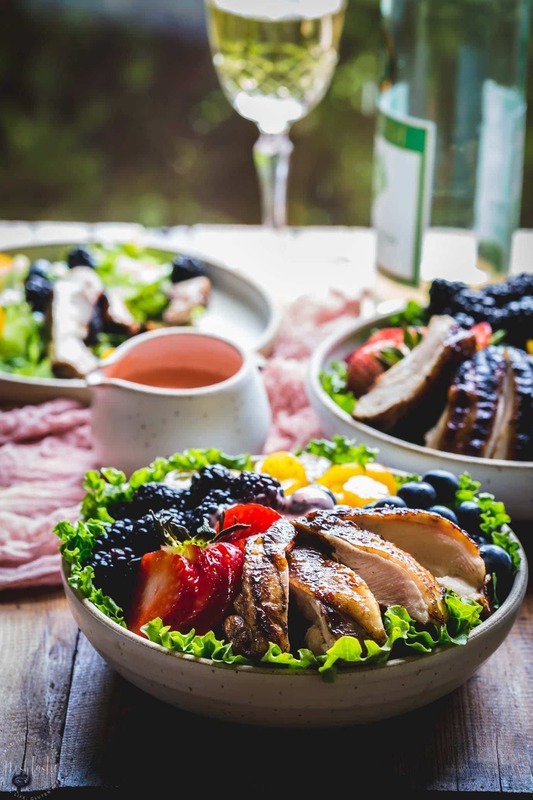 Serious Eats says that in 1046 the Holy Roman Emperor Henry III was given a little silver bottle of Balsamic Vinegar on the way to his coronation, so it’s certainly been around for a long time! 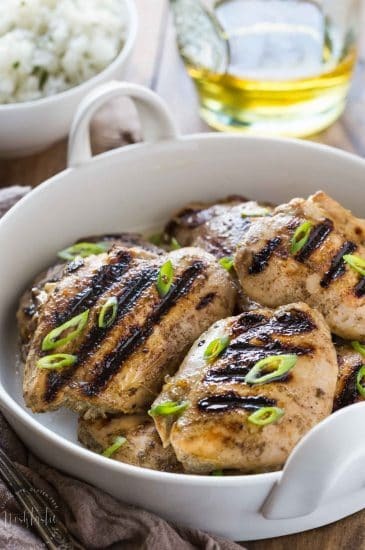 Marinating the chicken is very easy, you simply mix together the Balsamic vinegar, olive oil, garlic, Dijon Mustard, and a little salt and pepper and then add the marinade along with the chicken thighs in a bowl, cover, and then leave it in the fridge for 1hr. Start by turning all the burners on your gas grill to low and then close the lid to allow it to heat up, this will take about 5-10 minutes. I like to brush the grate with a little oil and then place the chicken thighs onto the grill with the side that previously had the skin on, down first. Make sure the thigh pieces are fully opened and flattened out on the grill so that they will cook more evenly. A really good salad always needs a fabulous vinaigrette. This creamy dairy free version is delicious and the strawberry flavors marry really well with the natural sweetness of the Balsamic vinegar. 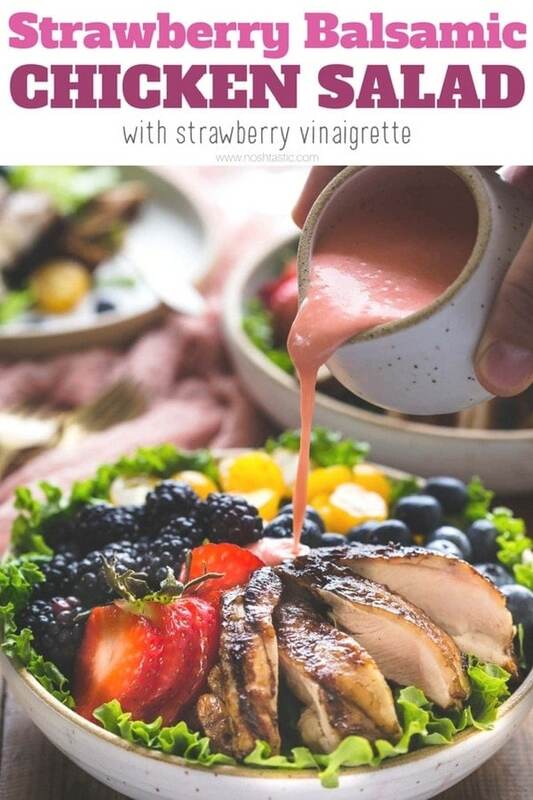 My Strawberry Vinaigrette is very easy to make, the main thing you need to do is to remove the tops of the strawberries before you add them to the blender. I tried to balance the sweet and savory flavors in this dressing so I’ve added mayonnaise, apple cider vinegar, a little garlic and some honey to sweeten it. This recipe is really dependent on having ripe flavorful strawberries. 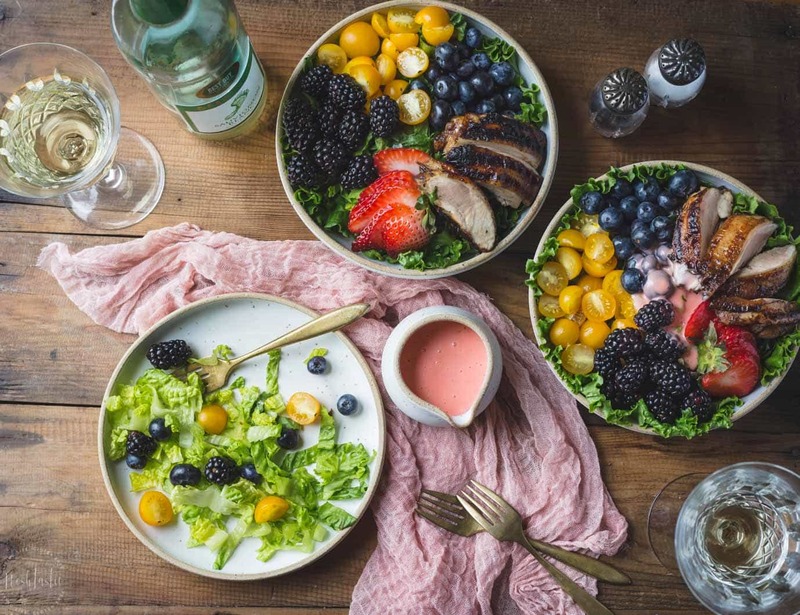 If the Strawberries are lacking in flavor then you may have a hard time tasting them in the dressing. For the salad, I have used Romaine lettuce and some mixed salad greens, but you can add whatever type of salad leaves you prefer. I love baby spinach and Arugula and I think they would be great alternatives. More Paleo Recipes You’ll Love! Are you looking for more easy dinner solutions? I’ve got you covered! I’m going to share a few of my favorites, but if you want more please be sure to check out my visual recipe index to see the rest. First up is my Paleo Meatloaf. It’s a healthier version of the classic American version, but I’ve omitted the breadcrumbs and added in some shredded veggies to give it a super healthy boost. 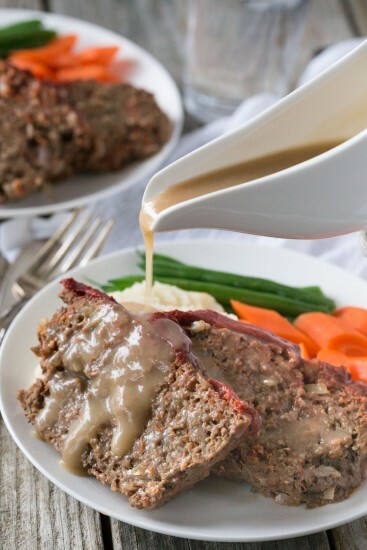 Oh, and I have a gravy recipe to go with it! 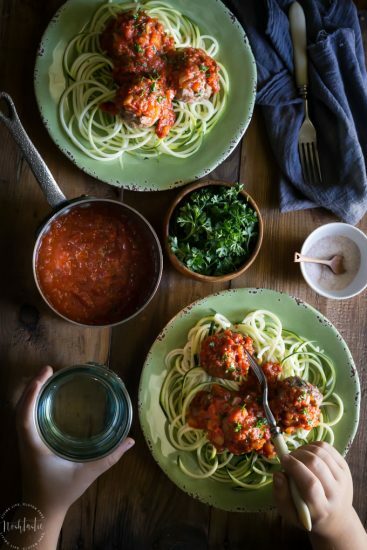 My Paleo Italian Meatballs with Marinara Sauce is my top recipe year round and for good reason! It’s really easy to make, healthy, and the kids will love it too! What about some Paleo Jerk Chicken? Don’t be put off by the longer ingredients list, it’s basically all added to a blender and then you simply let the chicken marinate in it, it’s truly delicious!! Mix the marinade ingredients together and add the chicken thighs, mix well, cover, and refrigerate for 1 hour. 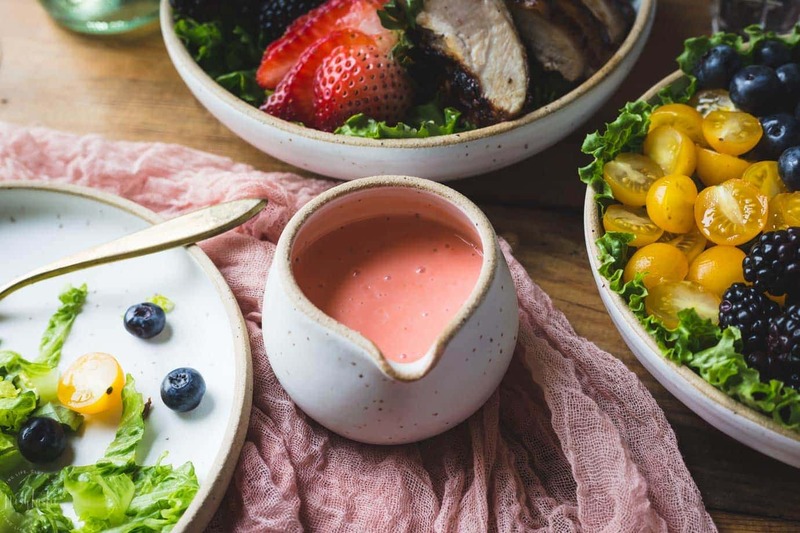 To make the salad dressing add the strawberries, mayonnaise, apple cider vinegar, garlic, dijon mustard, and honey to a blender and blend until smooth. See below for cooking instructions. Turn all the burners on your gas grill to low and close the lid to allow it to heat up, about 5-10 minutes. Brush the grate with a little oil, then Place the chicken thighs on the grill with the side that previously had the skin on down first. Make sure the thigh pieces are fully opened and flattened out on the grill. Cook on each side for about 5-10 minutes or until chicken is fully cooked. Turn the pan onto high heat for a few minutes, then turn it back to a medium heat, brush it with a little oil. Add the chicken pieces to the grill pan with the side that previously had the skin on, down first. Do not crowd the pan, and make sure the thigh pieces are flattened out. Cook for 5-6 minutes then turn the chicken pieces over and rotate the pieces as needed until the thickest part of the chicken is fully cooked. While the chicken is cooking you can prepare the salad bowls. Arrange the romaine and salad leaves in the bottom of the bowls, then top with the fruit and tomatoes. 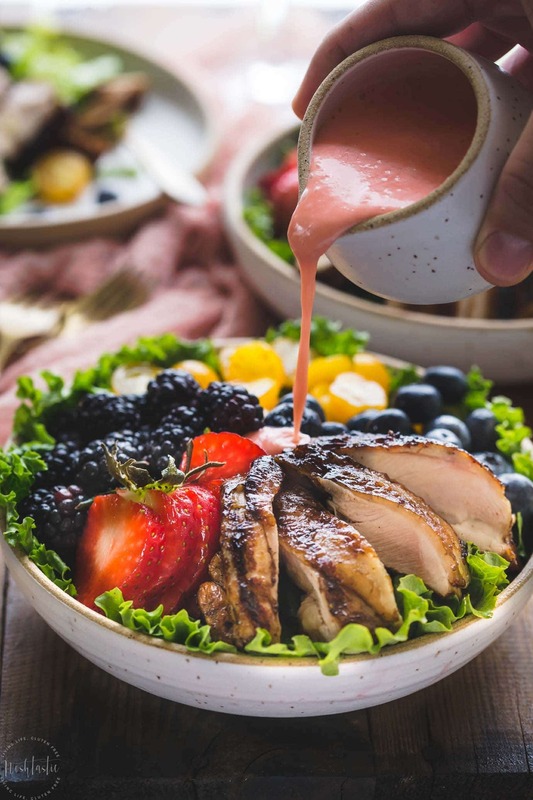 Slice the cooked chicken and add to the salad bowls and serve with the salad dressing on the side, or pour over and toss the salad if you prefer.